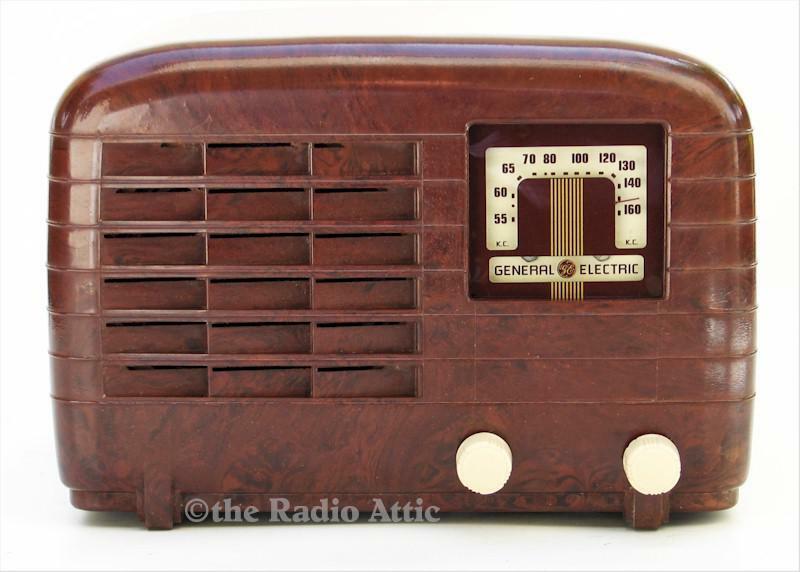 This early Bakelite radio from General Electric was one of the first of a wave of Bakelite table sets that would become the most popular style of radio for the next decade and a half. The rounded shape, ribbed sides, and complex louvered speaker grille demonstrated the versatility of molded plastic. The ivory knobs add a nice accent to the appearance. Unlike most later Bakelite sets, this one has an elaborately molded Bakelite rear cover as well. The six-tube chassis also set a trend with its built-in loop antenna. The sixth tube in this set is not an RF amplifier stage, but rather an extra audio amplifier stage incorporating feedback for reduced distortion, higher fidelity, and very low hum (this radio was designed for both 25 and 60 cycle AC). Sensitivity and sound quality are excellent. Chassis restoration included replacement of all electrolytic and paper capacitors, new resistors where needed, a strong set of tubes, and rewiring of the switch and grounding circuitry for improved safety with the new polarized power cord. Lighted dial. New reproduction dial (I'll give you the original as well). 10-1/4"W x 7-1/4"H x 7-1/2"D.
You are visitor number 1,362 to this page.